When twins Lindy and Kris find a ventriloquist’s dummy in a Dumpster, Lindy decides to “rescue” it, and she names it Slappy. But Kris is green with envy. It’s not fair. Why does Lindy get to have all the fun and all the attention? Kris decides to get a dummy of her own. She’ll show Lindy. Then weird things begin to happen. Nasty things. Evil things. It can’t be the dummy causing all the trouble, Can it? 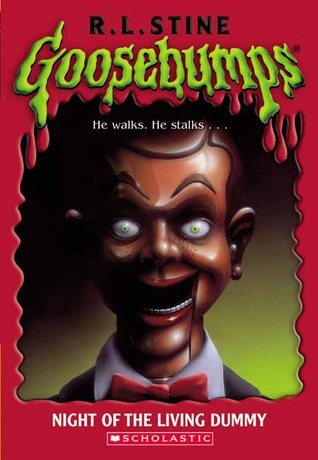 When reading a hard cover book that I don’t have as an epub book, Goosebumps are the perfect side read when commuting. An easy read and the characters felt realistic and not “too much” as some of the previous main characters did. And what was best about it was that I couldn’t forsee the ending at all. Maybe that was the same with the other ones? Can’t really remember. But it was unexpected and I didn’t know how it would end until the very last page which supposedly left me with goosebumps. Fun reads! 3 out of 5. This entry was posted in Book Reviews and tagged 3 out of 5, Goosebumps, horror, R. L. Stine, Scholastic, Scholastic Inc by Alexandra. Bookmark the permalink.